as she sat under yon willow tree. I did salute her most graciously. saying 'False young man, you have deluded me'. it's that I'll rue until the day I die. instead of gold, it's brass I find. in hope that you and I will meet again. This is one of the first traditional songs which I remember really standing out in my mind after I heard it at a session, and making me want to start singing traditional songs myself. As I recall, it was a session in O'Grady's pub in Coolaney (Co. Sligo) and the song was sung by an Englishman called Jim who was visiting the area, perhaps on holiday. I must have been quite a small boy at the time. Maybe the main reason the song was so memorable is the lovely tune to which the words are sung. I later found a recording of Andy Irvine singing the song, and have heard several others singing it since. The title 'As I Roved Out' seems to be a common one for traditional songs, probably due to many first lines starting with these words. to get to Cavan town. my Cavan girl so fair. the colour of her hair. the colour of her eyes. of every boy in Cavan town. she'll talk to me awhile. and back to her I'll go. A song written by Thom Moore in 1978. Thom's own recording of it is included on his album Seven Things Aloom. ​​This newspaper article tells the background story of the song. and looks out on the sea. who hunted for the wren. went hunting for the wren. between the hills and sea. This is justifiably one of the most respected and appreciated of Irish traditional songs. 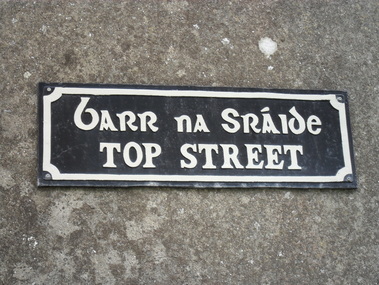 Barr na Sráide is a street in Caherciveen, Co. Kerry. I learned the song a long time ago from Seán Garvey. A few years ago, I was in Caherciveen and decided to have a look at famous Barr na Sráide. A lady in a shop directed me, and I found that, as in the song, Barr na Sráide does indeed climb the hill behind the town and overlooks the sea. Here are some photos I took that day. 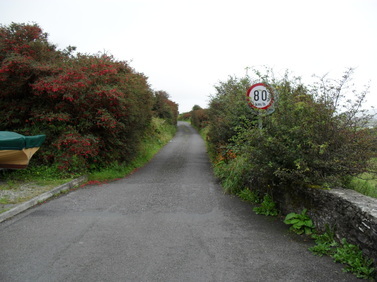 I do not recommend 80 km/h on Barr na Sráide! There was a tradition in Ireland of hunting a wren (pronounced 'ran' in the song) on December 26. The 'Wren Boys' then went about the locality with the captured bird, playing music, singing or dancing, and collecting any donations the people made. The custom of wren boys doing the rounds on December 26 is still carried out sometimes, and any money collected might be given to a charity in some cases, though thankfully I have never seen a captured wren used as in the past. The word 'dreoilín' in the second verse of the song is the Irish word for wren. The third verse refers to the Auxies and the Black and Tans. Auxies were members of the Auxiliary Division of the Royal Irish Constabulary, former British soldiers who were recruited during the War of Independence in Ireland, their main role being opposing the Irish Republican Army of the time and launching revenge attacks, often on civilians. As with the Black and Tans, their presence in Ireland was sorely resented by many. This song was written by Sigerson Clifford. and I won’t be back till the drovin’s done. sets me up, then takes it all away. Ends with the coming of the day. But it’s been so long and it’s hard to change my mind. A song written by Hugh McDonald. The Diamantina is an ephemeral river in Australia, made up of several shallow channels, which dry up at times, surrounded by the broad, flat Diamantina river basin. The area was used for grazing cattle at times of the year when grass was available, though the climate is very hot and dry for much of the year. with a blithe glance in her eye. was awaiting her with joy? on the mountains of Pomeroy. no war could e'er destroy. and all the valley through. on the Mountains of Pomeroy." on the arm that would be free. and the tumbling torrent's foam. A tragic love song, written I believe by a Dr. George Sigerson, set in the hills near Pomeroy, Co. Tyrone. The tune is often played separately as a march, though the song is best sung more slowly. And shows her valleys green. You mean that much to me. They had dissolved the spring. That never hides the stars. From Salthill to Eyre Square. Was never lit so fair. This was written as a poem by Oliver St. John Gogarty and adapted into song by Galway man Tony Small. I am grateful to Tony's sister Angela for giving me a recording of Tony singing the song. It was recorded by Tony for an album of his which unfortunately is not currently available. Tony Small died in 2013. A more recent CD of his, Mandolin Mountain, is available to buy, and is an interesting and enjoyable album. her mountains rude and wild. the reason to me tell? my sheep and cattle died. why I left old Skibbereen. to drive us all away. fell on that snowy ground. you bore your father's name. will rally, one and all. Skibbereen mentions some of the horrors of the famine which occurred in Ireland from 1845 to about 1852, and the feelings of some of those who emigrated at that time. The famine was caused by a long history of oppressive government which resulted in millions of people living in extreme poverty on tiny patches of land, for which they were expected to pay rent to landlords, many of whom resided in England. Much of this land, which originally had been in Irish ownership, had been seized two centuries earlier and allocated to various settlers from Britain. The severe poverty and lack of resources resulted in many people surviving mainly on potatoes, since these produce a higher yield per area than many other crops. However, during the famine years, the potato harvest dropped sharply due to the spread of potato blight disease. Large quantities of grain crops were still being grown in the country, but these were exported throughout the famine years for the profit of the landlords. to fight against our fate. 'Van' in the last verse means the leading division of an army. My name is Napoleon Bonaparte, I am the conqueror of nations. I banished German legions and drove kings from their thrones. but now I am transported to St. Helena’s shore. pious and graven images in thousands down I threw. but if he’ll give me time and space back to him I’ll restore. but to wed the German’s daughter, it grieved my heart full sore. she saw me in battle-flame, and she did me adore. but I intend to shine in armour bright through Europe once again. One of several traditional songs about Napoleon. Frank Harte used to do a fine job on this one. Oh I loved too much and, by such and such, is happiness thrown away. And word and tint, I did not stint, for I gave her poems to say. With her own name there and her own dark hair, like clouds over fields in May. When the angel woos the clay he'll lose his wings at the dawn of day. A poem by Patrick Kavanagh, sung to the tune The Dawning of the Day. For I must go to sea for the love of you. Since you and I must part, my own true love. What more can you desire, love? Don't complain. But you must think of me when I am gone. Your absence proves me lost and strikes me dead. And when you are far from home, servants I'll have none at all. For I'd rather live all alone than in company. For to go to sea it was her heart's desire. That she a maiden was, all at that time. No thought of our ship being wrecked, away we went. Which caused our lives to lay in discontent. I swam to the shore, but my love was drowned. Which causes me to weep for evermore. This old song survives due to a record by Ralph Vaughan Williams from 1904, when he visited a Harriett Verrall in Sussex, England, and noted down the tune and words from her rendition. he had a daughter could make good tea. two bigger shavers you never did see. we were starving slaves out on Scattery. till fish grew plenty on Scattery. she seemed to me like the queen of May. a true love letter to you I’d write. as far from land as once I might be. a woman’s love would not trouble me. how to gain that young lady fair. This is currently one of my favourite songs. It is set in Nova Scotia, Canada, and tells the story of a man who has gone there to work in the Caledonian coal mine (which helps to explain the second line), and who falls in love with a girl from Boularderie, an island off Cape Breton. Scattery, mentioned a few times in the song, is another island in the area. 'Brochan', as I understand it, is a type of porridge made with oats. I learned this song from a version recorded by Martin Simpson.